M Polo-López, G Miotto, J F Fondevila-Gascón (2018): “My Time: Incidence of on demand television in the evolution of ‘prime time’ in Spain”. Revista Latina de Comunicación Social, 73, pp. 208 to 227. Introduction: The aim of this research is to analyze the impact of television à la carte on prime time audiences in Spain. The emergence of different television channels over the last few years has led to a fragmentation of the audience in terms of the television offer and the particular tastes of each individual among the audience, which has reached the maximum expression since the moment that viewers can choose the content they want, whenever they prefer. The catalyst for this evolution in the consumption of television is technology in general and internet in particular, which together offer the necessary devices so that the consumer of audiovisual content can access them in the fastest and most comfortable way. Methodology: The research is based on quantitative elements such as the analysis of the audiences obtained by the main programs in television in Spain between the years 2002 and 2015, and is complemented with relevant qualitative evaluations that include the contributions of professionals who represent the main companies in the sector. Results and conclusions: Television is valued as a relevant medium, but with nuances in terms of programs and how to consume this television. On demand television; prime time; television audiences; media planning; interactive television. 1. Introduction. 1.1. Media planning. 1.2. The audiences. 1.3. On demand TV. 2. Methodology. 2.1. Selection of the sample. 2.2. Fieldwork. 3. Results. 4. Discussion and conclusions. 5. Notes. 6. List of references. On the first decade of the XXI century the concept “My Time” appeared in media agencies, an evolution of the usual television term “prime time”, the name of the time slot of maximum audience in a media (González & Carrero, 1997; Lejarza, 2012; Vaca, 2009). This new expression was specially related with viewing television content in different moments compared to what has been considered as usual up until then (Wakamiya, Lee & Sumiya, 2011a). In this sense, the high audiences that historically dwelled in prime time dissolved into other spaces, either physical or temporary . The new consumption spaces emerged thanks to the technological changes produced in previous years, and that made the access of viewers to television broadcasts easier, in any moment and place. The concept of “My Time” has been used specially in media agencies, but it also appears in different publications, both in the national sphere as well as in the international arena. Thus, authors such as the Colombian Urrea (2011) or different papers published in the last years (Fernández, 2010; S. García, 2012; Politecnico di Milano & Studio Frasi, 2013; Sanmartín Cuevas, 2013) have used this expression to refer to the moment each individual preferably watches television. On the other hand, other authors use the concept “anytime”, related to the fact of watching television at any moment (Lejarza, 2012; León, 2012; Vinader, Abuín & García, 2012; Wakamiya et al., 2011a; Wakamiya, Lee & Sumiya, 2011b). Investigating about the transformation of the “prime time” concept, the time slot of maximum audience, it is worthwhile due to what this period of the day represents compared to the rest of time slots for different televisions, advertisers and the market, in the end. Besides, the evolution interactive television had in the last years makes us portend that in not a very far future, radical changes will be produced in this media, up to the point of having a television model that could be scarcely related to the one we have known up until now. We must consider that the advertisement market generates a high volume of investment. Thus, for instance, the investment destined to planning and purchase of conventional advertisements spaces in Spain on the year 2016 was about 5.300 million Euros, 40% of which were invested in television . Why is an individual obliged to watch his favorite series at ten o’clock on Monday when he or she can watch it at four o’clock a Saturday? Why is there the need to watch it on television in the living room at home if it can be watched in another room, or in the computer, using Internet? To answer these questions, we investigate how the implantation of on demand television in Spain has affected audiences in the ‘prime time’ time slot. In the theoretical background, we analyze the three following elements: media planning , audiences and on demand television. In each one of the three topics we analyze the different relevant definitions that some authors or researchers have contributed with and the influence of the state of the art of the study issue. In a complementary manner, we will evaluate the interconnectivity there is between the three topics, because even though they can be evaluated independently, their view as a whole will enrich this framework. Anyways, we observe that in most definitions, the relevance of the purchase of advertisement spaces is confirmed, together with the economic investment associated thereto. The advertisement market is managed by media planners; whose main purpose is to achieve the best optimization of their media plan: reach the maximum number of individuals at the lowest cost possible. In the history of advertisement agencies in Spain we can understand better how the relevance of planning – and of investment volumes managed year after year, have influenced the evolution of the main parties involved. “There is a clarifying data, 90 percent of advertisement budgets are destined to the purchase of media, therefore creativity and production represents 10 percent” (Eguizábal, 2009: 286) . It is advisable not to forget that the final goal of all campaigns these agencies or companies launch is to reach the target public through the necessary advertisement impacts required to influence their purchase decisions. These impacts, measured in the so-called “audience ratings”  (Cannon, Boyle, & Smith, 2010) in the case of television, are one of the main tools media agencies have available to plan campaigns. As said earlier, the main objective of any campaign is reaching its target public in the most efficient and efficacious way. Butsch (2008: 117) refers to the historic evolution of the concept and Silverstone (1996: 282) is focused more on the individual’s features against the group or mass. On her part, García Gajate, (2015: 67) distinguishes between “the audience-as-mass, the audience-as-data and audience-as-agent.” On the other hand, Jauset (2008: 228) offers a more technical definition, referred to the audience on television “as the group of individuals that keep contact with a media [...] through a program or advertisement space, and during a period of time.” Furthermore, O’Neill, Gallego and Zeller (2014: 157) refer to actions the viewer performs with media and social relationships. Figure 1: Evolution of the participation in the advertisement investment of television and Internet media between the years 1999 to 2015. Source: Infoadex. Audiences turn into the cornerstone of media mainly because “the remuneration paid by the sponsor to the television company places audiences as a transaction object" (Herrero & Urgellés, 2015: 69). Besides, the changes in consumer habits have led to a new paradigm, based on the minimization of the consumer role (Husni, Halpern, & Price, 2016: 35). In this sense, Blumler (1996: 98) mentions the great groups of consumers from a media, and how they constitute into an audience. The same changes in habits regarding contents consumption, favored by technology, are the ones that “have granted the audience unimaginable consumption possibilities in previous times. Viewers decide what, how, where and when they watch contents, without the need to comply with the guidelines of managers and programmers." (Medina, 2015: 7). In the last years, from the implantation of DTT  in Spain on 2010 and since the emergence of Internet, again there is the uncertainty about whether the main media in Spain for the last 60 years will be damaged. Since back then, and through the last years, we have seen how television kept positioned first regarding advertisement investment volume, even though Internet has been increasing exponentially , as evidenced on figure 1. The percentage of advertisement investment destined to television in the last 16 years in Spain has maintained between 40 and 43%, being the main media through all these years. To confirm that television keeps achieving high audiences, and to evaluate how they are changing in the last years, we perform a detailed analysis of the rankings of the 15 main television broadcasts from the years 2002 to 2016. As a summary, we have included the following comparative table (figure 2). - It is evidenced that the most seen programs in the last fifteen years correspond to specific events, not to series, movies or usual programs in the channels’ grids, coinciding with Lara’s opinion . Thus, for instance, football gathers the greatest presence in the rankings first places in all years, except years 2002 and 2003 with the Eurovision contest. During these years, the elevated audiences achieved by the contest program “Operación Triunfo” (figure 3) are worth mentioning. In the year 2002, specially, this program was successful in maintaining 4 broadcasts within the ranking of the 15 most seen programs through the year. In the years 2003 to 2005, series of their own production were performed in different televisions with sustained high audiences for many weeks, allowing to reach high peaks of audiences and appear on annual rankings. 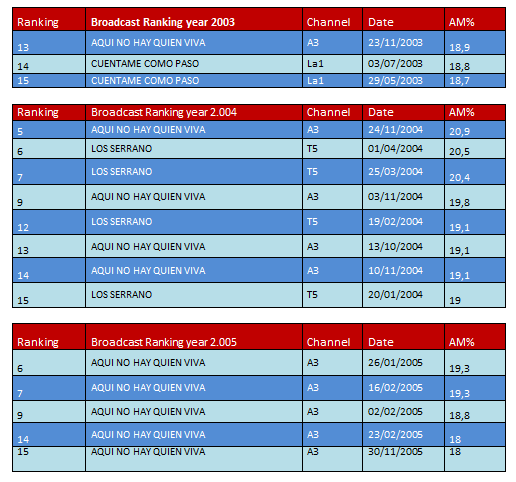 In this group series such as “Cuéntame cómo pasó” (Channel 1) are worth mentioning, which achieved two broadcasts between the 15 most seen in the year 2003, then “Los Serrano” (Tele 5), with four broadcasts on 2004 and “Aquí no hay quien viva” (Antena 3) which also achieved four broadcasts on the year 2004 and five in the year 2005 (figure 4). Therefore, the series was successful in occupying a third of the 15 broadcasts of maximum audience in this last year. From this year, and until the year 2011, the 14 or 15 first places of the ranking are occupied by sports programs or events. In the data of the last three years (2011 to 2013) the high audience achieved by the series “Águila Roja” is outstanding, issued by La 1 of Televisión Española, getting intermediate positions in the rankings of these three years. The audiences achieved by Campanadas de fin de año inLa 1of Televisión Española (figure 5) in these three years are also worth mentioning. - We also observe the progressive drop of audiences of the first 15 programs every year between 2002 and 2007. In the year 2008 there is a great rise in the maximum audience, caused by the participation of the Spanish football team in the Euro Cup that year, and the final winning of the championship. In the years 2009 and 2010 levels of maximum audiences similar to the year 2008 maintain again due to sports reasons: Champions League of the year 2009 achieved by Football Club Barcelona and the South Africa World Cup of the year 2010 for the Spanish football team. In following years, leader audiences slightly reduce, but still keep in higher levels than those achieved during the 2005-2007period. - We evidence the concentration of sports programs among the broadcasts with more audience up to the point that in the last years analyzed (2013 to 2016) there are hardly any programs different from sports in rankings. And those programs that position among the fifteen most seen every year, do so thanks to being broadcast between sports programs, with the audience said programs pull. 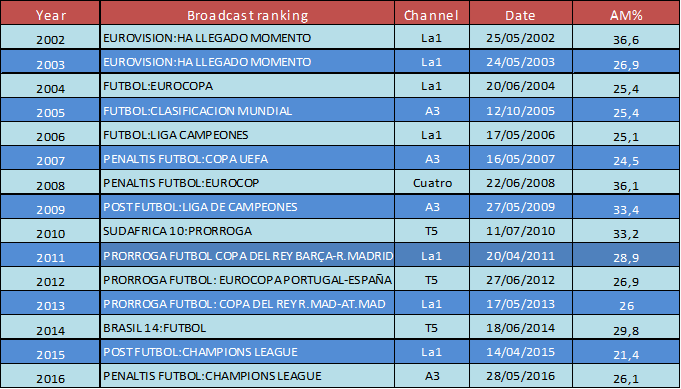 In this sense, in the ranking of 2015 there outstand the fifth and sixth positions achieved by “Telediario 2” and “Sorteo de loterías y apuestas del Estado” that were broadcast on April 14 during the break of the Champions League Game. Likewise, the ninth and tenth position of the ranking that same year are achieved by the same programs mentioned before, because they were broadcast during the break of another game belonging to the same sports competition. The main authors coincide in the opportunities this new situation offers to communication, because today television is more than a simple receptor (Hess, Ley, Ogonowski, Wan, & Wulf, 2011) and the social experience opens new scenarios for interactive television (Roibás, Furtado, Geerts, Calvi, & Fortaleza, 2006). Regarding the issue of our research about audiences, we can observe different researches about interactive television interested about it. Some do research about how audiences interactivity with television is produced specifically with the smartphone(Group, 2011), others analyze the audiences communities and social networks (Doughty, Rowland, & Lawson, 2012) and finally, some evaluate the difficulty faced by television channels to manage audiences in both screens at the same time (Carter, 2011). We shouldn’t forget that, with this situation, television channels control their audience better and know the comments made about their programs, and how are they evaluated (Quintas-Froufe & González-Neira, 2014a). There is a wide bibliography about the phenomenon of television linked to Internet. Some authors even consider whether Internet is already an alternative to television media or, on the contrary, only a complement (Cáceres & Brändle, 2011). The technological progresses that allow to watch television in a different way grant the audience a greater control and freedom over the programing selection (Madrid & Marcos, 2013) and opens new possibilities for the development of advertisement strategies (Quintas-Froufe & González-Neira, 2014b). But few authors have evaluated the relationship between on demand à la carte television and the implications this entails for audiences and/or their measurement. Among the most recent researches there outstand the analysis of how advertisers value the appealing advertisement platform offered by the binomial: on demand television with Internet, which enables segmenting their audiences with a greater detail (Fondevila Gascón, 2009; Carrasco Molina, 2011), or what is the political dimension that this combination of both media and their measurement produces in countries such as France, Israel, United Kingdom and the United States (Bourdon & Méadel, 2015). The geographic factor, for instance, can be more relevant than it seems. Without entering in the restriction of the fact that one country has a greater Internet consumption than another, that it has one or different time zones may condition the social use given to television, considering the lack of time coincidence in audiences habits. Hence, countries like Australia, with three times zones, or United States, with six main time zones, difficult a greater increase of social audience shared live (Hallvard, Poell, & van Dijck, 2015). The industry of audiences measurement must offer new proposals before the digitalization phenomenon (Portilla Manjón, 2015), in such a way that other researchers suggest measurement models for these audiences based on technologically simple tools, such as audio record and subsequent comparison with the broadcast programming (Lim, Choi, Nam, & Chang, 2014). Before this new “liquid television” (Quintas-Froufe & González-Neira, 2016) it is indispensable to find the most adequate technique to merge the data of traditional audience with those of the new ways of watching television. Considering the contribution of the different authors, it is evident that there is still a long way to reach the desired measurement level. And due to these same reasons, the authors of this research are working in an audiences measurement project that aims to weight calculation criteria in each one of the media to obtain a unique source of audience data. The project includes two areas of complementary research: on one hand, related to the evaluation of HbbTV audiences (hybrid or connected television); on the other hand, related to the media as a whole. For this second area we include a starting point scheme below (figure 6), that leads to the design and creation of weighing algorithms of the different audiences. 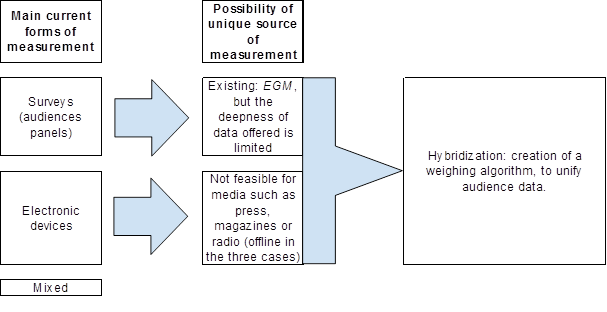 Figure 6: Starting point scheme for the design of a unique source of audiences measurement. Authors’ own creation. Delving further in the different typologies of studies related with on demand television, few authors analyze in detail the relationship of this television with advertisement. Thus, while some researchers have focused in the conversion from the analogical to digital transmission in Australia, evaluating its implications in the advertisement market (ACMA, 2013), others have evaluated up to 500 campaigns in 6 years of interactive television in the United Kingdom, the market with one of the greatest penetration indexes of this kind of television, close to 90% of homes (Bellman, Schweda, & Varan, 2012), with the aim to identify the factors that may condition a greater or lesser response rate to advertisement. In the case of Spain, the interaction between the main television channels and Twitter, the social network linked most to the world of television, has been analyzed (Gallego, 2013). However, the researches investigating the relationship between on demand television and the time slot of greater audience of a free TV, the ‘prime time’ are practically nonexistent. In this sense, the contributions of González-Neira & Quintas-Froufe (2014) outstand, which work consisted in comparing the real audience and the social audience of different programs broadcast in prime time in Spain between April and May 2013. Since Internet allows that each user can program the television grids as convenient, the user can build his particular prime time without being conditioned by free channels (Ruano López, 2014). Finally, the approach to ‘my time’ (Sanmartín Cuevas, 2013) is the closest to our research. To achieve the objective of this research, about analyzing the impact of on demand television in prime time audiences in Spain, we used a methodology based on triangulation (Davies & Hughes, 2014; Daymon & Holloway, 2011; Golfshani, 2003; Lindlof & Taylor, 2002; Ruiz Olabuénaga, 1996) to compare two or more forms of evidence regarding the research object . In a first quantitative stage, we gathered audience data of the 15 first broadcasts of the last 15 years (periods 2002 to 2016), which besides allowed analyzing the typology of most watched programs every year. On the second stage, we considered using in-depth interview to achieve an enriching type of information, based on personal and professional experience of respondents. This technique, which is the most relevant one among qualitative techniques according to different authors (DiCicco-Bloom & Crabtree, 2006; King & Horrocks, 2010; Myers & Newman, 2007), aims to approach the investigated reality through the deep knowledge of the respondent about the matter (Belk, Fischer, & Kozinets, 2013: 31). Information about respondent, granting a lot of relevance to the current job position in the company where he or she develops the professional labor, especially the years of work experience and the functions carried out. Set of questions about audiences in television. This section centers the topic in the origin of the issue (audiences in television), and we aim to know the expert’s opinion about their relevance for television channels or in their evaluation about how these audiences have evolved in the last years. Besides, in this section, a reflection with the respondent is opened about the ‘prime time’ time slot, in how he or she believes it has evolved in the last years, if there were different evolutions depending on the target public, and if there has been any element that has influenced in this transformation. Set of questions referred to viewers habits. Considering respondents’ professional experience, we aim to know the changes television viewers have undergone in the last years, and if there have been differences depending on the different publics. We perform the analysis of the possible factors that may have influenced said changes. The fifth section is concreted in the different ways of viewing television, starting from the models of the origins of this media in Spain and evaluating how they might evolve in the future. Moreover, we want to evaluate whether there is a change in the television model. This section wraps up questioning respondents whether they consider on demand television conditions the volume of audience TV channels achieve in prime time, which gives a direct response to the main research question. The sample technique at this point is discretionary (also known as purposive or judgmental), where the knowledge respondents might contribute with predominates, and where results can be more accurate. This better knowledge or judgement of respondents is supported by their professional profile and the years of experience dedicated to the study subject. Thus, interviews are focused in managers or responsibles of media agencies in Barcelona, and sales representatives of the main television channels in that same city. Therefore, interviewed agencies belong to business groups that accumulate more than 70% of the advertisement invoicing in Spain, and the three main groups of television channels in the area of Catalonia. The agencies are Havas Media, Dentsu Aegis Network, ZenithMedia, Mindshare, Mediabrands, Ohmm and Nivoria. The first five belong to the different main multinational groups, Ohmm is a local agency and Nivoria is an agency in the digital field. The proportions of the sample match invoicing of the typology of chosen agencies. We decided for this variety in the selection to know the opinion of profiles from different companies, so that results are not influenced by the profile of participating companies. Regarding television channels, interviews were done to representatives of the Mediaset communication groups (which comprise television channels such as Tele 5 and Cuatro), Atresmedia (which channels such as Antena 3 and la Sexta) and TV3-Televisió de Catalunya, the three most relevant from the advertisement perspective in the area of Catalonia. Fieldwork and results gathering was performed during 2015-16. A few weeks before starting fieldwork we personally contacted by telephone or email with the ten individuals that should be interviewed, so to maximize the response rate. It was essential to keep the number and profile of respondents, since out of the seven individuals linked to agencies, six had the job position of managing director (or equivalent) or, in Nivoria’s case, CEO. In the remaining case of agencies, the job position was Planning director, responsible of one of the office teams. In the case of television channels, in one of them the interlocutor was going to be the director of the Barcelona office from the channel, in another case, a Division director (with functions of director of the commercial team) and in the third case, it was an individual linked to the area of digital development from the television channel. To respond to the main research question, which states whether “the implantation of on demand television in Spain has affected the high audiences in the ‘prime time’, time slot” we present respondents’ main statements regarding the different sub-questions of the interview. Thus, in the section dedicated to the analysis of on demand television and audiences in ‘prime time’, specifically with the relevance of audiences for television channels and for the sector, respondents mention the economic relevance that audiences represents for television channels, because channel’s patrimony are audiences (Ferdi Boloix, managing director in Dentsu Aegis Network) and that without audiences there is no public, no product, no business (Jordi Pi, executive producer of digital media in TV3). Following the same section of the analysis of online television and prime time audiences, but focusing instead in the evolution of audiences in the last 15 or 20 years, the evaluation of professionals coincides in the reduction produced through these years, because 25 years ago with a spot in Televisión Española a Friday night, a coverage of 80% was reached (Marta Coll, managing director in Havas Media) or like in the year 90, with a 24% share channels fought for the leadership they now achieve with 15% (Rafael Aisa, area director in Mediaset). To conclude the analysis of on demand television and prime time audiences, but foreseeing television audiences in the next five or ten years, respondents keep evaluating television as a relevant media, but with nuances regarding programs and the way of consuming this television. Thus, there will still exist events where television will keep congregating a great amount of audience (Ferran Cros, managing director of Mediabrands), but that the different publics will consume from different screens (Joan Guitard, sales team director in Atresmedia) and that will specially impact the time slots of greater audience volume, such as ‘prime time’. Deepening into this issue, and regarding the evaluation about the advertisement saturation, viewers habits, and how they impact prime time audiences, the contributions of respondents coincide in how audience has been fragmented, mainly from the increase of television channels (Marta Coll, managing director in Havas Media), and how the different audience groups require specific contents for them in the dynamic of ‘cloud journalism‘(Fondevila Gascón, 2010 and 2013), which translates into making televisions for more individual or on demand television (Sergio Plaza, managing partner in Ohmm). Finally, regarding the emergence of Internet and access to contents from other places, respondents consider that the network offers the option of viewing in the moment the viewer wants, in a nonlinear manner, which justifies the growth of this kind of audiovisual consumption. Specialists consider this phenomenon is irreversible, and suggest that channels evolve towards an elevated number of live events. On demand video seems more destined to fiction and entertainment, inclined to a second screen or Internet. The broadcast of live television turns into one of the values associated to high audiences, and sports retransmissions in the remedy against audiences fragmentation (Martin, López-González & Fernández-Cavia, 2017). In short, ‘prime time’ will lead the way to ‘my time’ (Ferran Cros, managing director of Mediabrands), and contents will be accessible at anytime, anywhere, in any device for any kind of public thanks to technology (Marta Coll, managing director in Havas Media). In such a way, we validate hypothesis H1, referring to how the implantation of on demand television in Spain has impacted audiences in the ‘prime time’, time slot. As discussion, the concept of “liquid television” suggested by Quintas-Froufe & González-Neira (2016), as the new way of viewing audiovisual contents and the need to complement data of traditional linear audience with those coming from the new forms of television consumption. This way, linear audiovisual contents that programmers organize in a television flow (Williams, 2003), will have the opportunity to be optimized for the objectives proposed. The need of new forms of measuring audiences, due to the difficulty belonging thereto, turns undoubtedly into an issue of interest, present in the works of Portilla Manjón (2015), Jennes (2011) or Suárez Rodríguez (2013). Even though there are authors like Oliver (2005), Videla & Costa (2012), Cáceres & Brändle (2011) which researches focusing on the fact whether Internet is an alternative to television or a complement, special relevance must be granted to those analysing the concept of ‘My Time’ vs. ‘prime time’, such as Urrea (2011), Sanmartín Cuevas (2013) or Ruano López (2014). This paper has analyzed the relationship between the viewing of on demand television and the behavior of audiences in Spain in the time slot of greater television consumptions, prime time. After analyzing the most watched programs in the last 15 years, we have observed how there was a reduction in the number of programs not broadcast live such as series or movies. On the contrary, sports events have consolidated as the television spaces that greater audience have achieved and reaching the highest numbers of broadcasts in rankings. We also observed the channel shares reduction in the last years, especially as a result of the emergence and growth of the number of television channels and the general atomization of the sector. According to respondents, the future landscape will experience a growth of programs that need to be seen live inescapably, such as sports events, in detriment of spaces that could be consumed on demand, in other moments of the day and even from other devices different from television. Therefore, on demand programing will gain a greater relevance than it has up until now and will not only impact ‘prime time’ audiences, but also remaining ones. It will be advisable to monitor the implications between television contents and social networks in the middle of television hybridization. Funded research: Research included in the Project: Challenges of the Managing Direction of Scientific and Technical Research, General Subdirection of Research Projects, Ministry of Economy, Industry and Competitiveness, “New forms of interactive advertisement in television, Internet and digital media. Real applications in HbbTV” (CSO2017-88895-R). Blanquerna-Universitat Ramon Llull. While television ‘prime time’ occurs at night, in the case of Spanish radio is between 6.30 and 9.00 hrs. In Spain, the ‘prime time’ of television is the time slot between 20.30 and 24.00 hrs. Some televisions extend the ‘prime time’ time slot until 24.30 hours. Furthermore, there are times where there is a difference between ‘prime time I’ and ‘prime time II’, being the later the one gathering a greater volume of audience, and that comprises the period from 22.00 hours until the end of the time slot. Source: Infoadex. Infoadex study of advertisement investment in Spain, published in the year 2017. Media planning is analyzed as a discipline or technique to understand what the changes produced in the consumption of television might represent for the advertisement market. Thus, we consider media planning as a general view of the concept, without focusing exclusively in television or Internet planning. Pérez-Latre gathers the definition of Donnelly, W. (1996) Planning Media: Strategy and Imagination. Upper Saddle River, N.J (U.S.A.): Prentice Hall. In a similar way, Fabre (1992: 7) states that “Le media-planning constitue, en quelque sorte, la partie immergée de l'iceberg publicitaire. (...) "Le media-planning représente souvent 85% d'un budget total de communication, les coûts de production et de création n'en représentant que 15%". Hagen (1999: 130) says that media are “slaves of the rating tyranny’”. Infoadex, analysis of advertisement investments between the years 1999 and 2015. "The great events live will be the ones differentiating programming” (Lara, 2009). "Triangulation involves the comparison of two or more forms of evidence with respect to an object of research interest" (Lindlof & Taylor, 2002: 240). ACMA. (2013). Digital TV planning | ACMA. Belk, R., Fischer, E., & Kozinets, R. V. (2013). Qualitative consumer & marketing research. London, New York, New Delhi: Sage Publications. Bigne, E. (1993). De la investigación de audiencia a la planificación de medios. En Audiencia y programación. Valencia: Ente Público RTVV. Blumler, J. G. (1996). Recasting the Audience in the New Television Marketplace? En J. Hay, L. Grossberg, & E. Wartella (Eds. ), The Audience and Its Landscape. Boulder -Colorado (USA): Westview Press. Bourdon, J., & Méadel, C. (2015). Ratings as Politics. Television Audience Measurement and the State: An International Comparison. International Journal of Communication, 9: 2243–2262. Butsch, R. (2008). The Citizen Audience. New York (USA): Routledge. Cáceres, M. D., & Brändle, G. (2011). El uso de la televisión en un contexto multipantallas : viejas prácticas en nuevos medios. Anàlisi, 43: 21–44. Carrasco Molina, E. (2011). Analysis of the advertising message on the segmented audience of IPTV. Revista Mediterránea de Comunicación: Mediterranean Journal of Communication, 2(1): 72–102. Carter, M. (2011). How to handle a two-screen conversation? En Television, 48, 18–19. Davies, M., & Hughes, N. (2014). Doing a succesful research project. Using qualitative or quantitative methods. (2a edición). London: Palgrave Macmillan. Daymon, C., & Holloway, I. (2011). Qualitative Research Methods in Public Relations and Marketing Communications (2a). New York (USA): Routledge. DiCicco-Bloom, B., & Crabtree, B. F. (2006). The qualitative research interview. Medical Education. Eguizábal, R. (2009). Industrias de la conciencia. Barcelona: Ediciones Península. Fernández, M. (2010). La influencia de la televisión en los hábitos de consumo del telespectador: dictamen de las asociaciones de telespectadores. Confederación ASGECO, 23(8), 80–91. Fondevila Gascón, J. F. (2009). La televisión IP (IPTV) y la transmisión mediante VDSL: realidad y perspectivas de negocio". Vivat Academia, 105 (9). Fondevila Gascón, J. F. (2010). El cloud journalism: un nuevo concepto de producción para el periodismo del siglo XXI. Observatorio (OBS*) Journal, 4(1): 19-35. Fondevila Gascón, J. F. (2013). Periodismo ciudadano y cloud journalism: un flujo necesario en la Sociedad de la Banda Ancha. Comunicación y Hombre, 9: 25-41. García, S. (2012). Las emisiones tradicionales frente al desafío de Internet: la integración estratégica de Antena 3. En B. León (Ed. ), La televisión ante el desafío de internet. Salamanca. Garitaonandía, C. [e a.]. (2003). Del espectador pasivo al interactivo. La televisión digital interactiva. En J. J. Igartua & Á. Badillo (Eds. ), Audiencias y Medios de comunicación. Salamanca: Ediciones Universidad de Salamanca. González, M. A., & Carrero, E. (1997). Manual de planificación de medios: todo lo que hay que saber para planificar correctamente los medios. Madrid: ESIC. Escuela Superior de Gestión Comercial y Marketing. González-Neira, A., & Quintas-Froufe, N. (2014). Audiencia tradicional frente a audiencia social: un análisis comparativo en el prime-time televisivo. Revista Mediterránea de Comunicación: Mediterranean Journal of Communication, 5(1), 105–121. Herrero, M., & Urgellés, A. (2015). La audiencia y hábitos de consumo. En M. Media (Ed. ), La audiencia en la era digital. Madrid: Editorial Fragua. Huertas, A. (2002). La audiencia investigada. Barcelona: Gedisa. Husni, S., Halpern, D., & Price, H. (2016). Managing Today´s News Media. Thousand Oaks - California (USA): SAGE. Jauset, J. (2008). Las audiencias en la televisión. Barcelona: UOC. King, N., & Horrocks, C. (2010). Interviews in qualitative research. Interview in Qualitiative Research. London: Sage. Lara, J. (2009). Miedo a la era digital en un mundo convergente. El sector audiovisual. En M. Francès (Ed. ), Hacia un nuevo modelo televisivo. Barcelona: Gedisa. Lejarza, M. (2012). El agua y las olas. En B. León (Ed. ), La televisión ante el desafío de internet. Salamanca: Comunicación Social Ediciones y Publicaciones. León, B. (2012). La televisión frente a internet. Una historia por escribir. En B. León (Ed. ), La televisión ante el desafío de internet. Salamanca: Comunicación Social Ediciones y Publicaciones. Lindlof, T. R., & Taylor, B. C. (2002). Qualitative Communication Research Methods (2a). Thousand Oaks / London / New Delhi: Sage Publications. Madrid, Z. & Marcos, M. C. (2013). The TV in a connected and interactive world: towards a TV viewer-centered. Enl@ce: revista Venezolana de Información, Tecnología y Conocimiento, 10(3): 95–113. R Martín-Guart, H López-González, J Fernández-Cavia (2017): “El deporte como antídoto contra la fragmentación de audiencias: Un estudio exploratorio de los programas más vistos de la televisión en España (1989-2016)”. Revista Latina de Comunicación Social, 72, pp. 1.027 a 1.039. Medina, M. (2015). La audiencia en la era digital. En M. Media (Ed. ), La audiencia en la era digital. Madrid: Editorial Fragua. Myers, M. D., & Newman, M. (2007). The qualitative interview in IS research: Examining the craft. Information and Organization, 17(1), 2–26. Negroponte, N. (1999). El mundo digital. Barcelona: Ediciones B.
Oliver, D. (2005). Internet en el contexto de la TV digital. En Á. Pérez-Ugena & F. Utray (Eds. ), TV digital e integración. ¿TV para todos? Madrid: Editorial Dykinson. O’Neill, B., Gallego, J. I. & Zeller, F. (2014). New Perspectives on Audience Activity. En N. Carpentier, K. C. Schroder, & L. Hallett (Eds. ), Audience transformations. Shifting Audience Positions in Late Modernity. New York (USA): Routledge. Pérez-Latre, F. J. (1997). Curso de medios publicitarios. Pamplona: Newbook Ediciones. Portilla Manjón, I. (2015). Television Audience Measurement: Proposals of the Industry in the Era of Digitalization. Trípodos, 36: 75–92. Quintas-Froufe, N. & Díaz-González, M.-J. (2014). Del apagón analógico al temático: El comportamiento de la audiencia televisiva española. Prisma Social: Revista de Ciencias Sociales, 13: 705–736. Quintas-Froufe, N. & González-Neira, A. (2016). Consumo televisivo y su medición en España: camino hacia las audiencias híbridas. El Profesional de La Información, 25(3): 376–383. Ruano López, S. (2014). The television 3.0 and the new formats. En Contenidos digitales en la era de la sociedad conectada. Madrid: Fragua. Ruiz Olabuénaga, J. I. (1996). Metodología de la investigación cualitativa. Bilbao: Universidad de Deusto. Silverstone, R. (1996). From Audiences to Consumers: The Household and the Consumption of Communication and Information Technologies. En J. Hay, L. Grossberg, & E. Wartella (Eds. ), The Audience and Its Landscape. Boulder - Colorado (USA): Westview Press. Vaca, R. (2009). El puzle de la audiencia televisiva. Madrid: Fundación Ex-Libris. Barlovento. Videla, J. J. & Costa, C. (2012). La televisión en la Red. Oferta y potencialikdades de la TDT en abierto. En B. León (Ed. ), La televisión ante el desafío de internet. Salamanca: Comunicación Social Ediciones y Publicaciones. Villanueva, P. (1999). La televisió interactiva: de televidents a TVnautes. Barcelona: Institut Català de Noves Professions. Vinader, R., Abuín, N. & García, A. (2012). La televisión conectada: nuevas formas de consumo de contenidos digitales en dispositivos portátiles. En B. León (Ed. ), La televisión ante el desafío de internet. Salamanca: Comunicación Social Ediciones y Publicaciones. Williams, R. (2003). Television. New York (USA): Routledge. Article received on 14 September 2017. Accepted on 20 January. Published on 4 February 2018.